1) Ludxor, Niño Hamburguesa, Venum vs Carta Brava Jr., El Apache, Fresero Jr.
5) Fénix, Myzteziz, Psycho Clown vs Averno, Black Warrior, Texano Jr.
Air Date: 08/09 – which means they’ll have to tape again before TripleMania? Which is a surprise because why not just make this two tapings and focus on the major show the next 11 days? Maybe there’s just another taping soon after? Again, there’s something weird with the schedule. AAA taped three weeks of TV between Xalapa and the Hard Rock Hotel show, and there’s four weeks of TV. I guess they’re being pre-empted one week? Or there’s another taping in between to be announced? 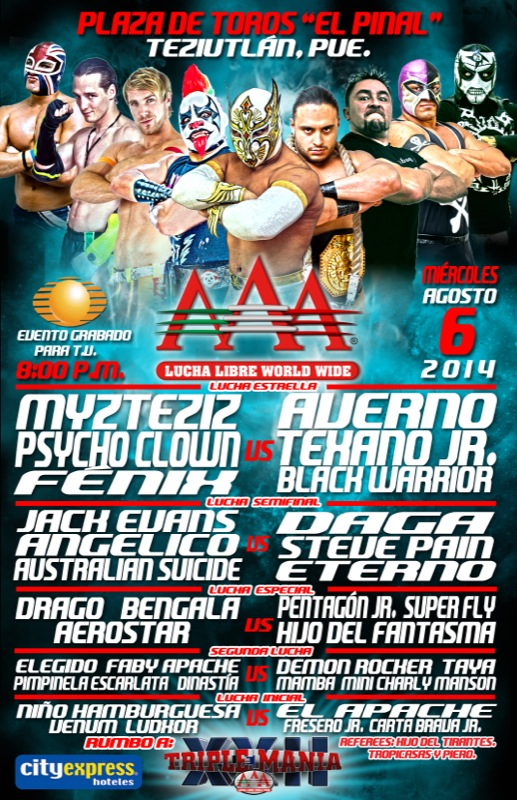 Or Mytzteziz won’t have his match announced on screen until 8 days before TripleMania unless they insert something? It’s all very strange, but AAA’s going to go four weeks without a taping unless another is announced. This show is not strange. Third and fourth matches should be really good and other matches have chances. There doesn’t seem to be much news here – Texano and Psycho continue facing off, as do Aerostar and Super Fly and Faby and Taya – but it could still be a good matches.